I am here at home on the Oregon Coast and it's business as usual for me! One of the inspiring parts of being an artist is creating outside of my studio and outside of my normal routine. I love being on the road and challenging myself to find new ways to create and while I am here I have all kinds of inspiration to share! 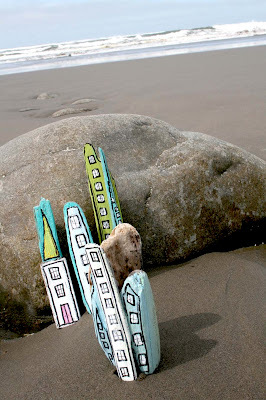 This driftwood city project has been in my brain for the last 6 months (it is actually what inspired my recycled cardboard city! 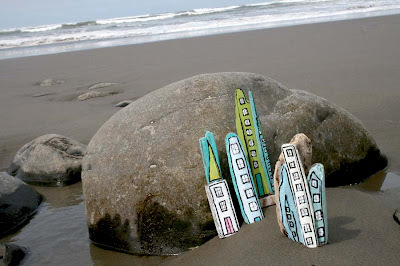 )- the only problem is there is not much driftwood at my home in Southern California so I knew as soon as I was back at home in Oregon I would be creating a little city out of driftwood! 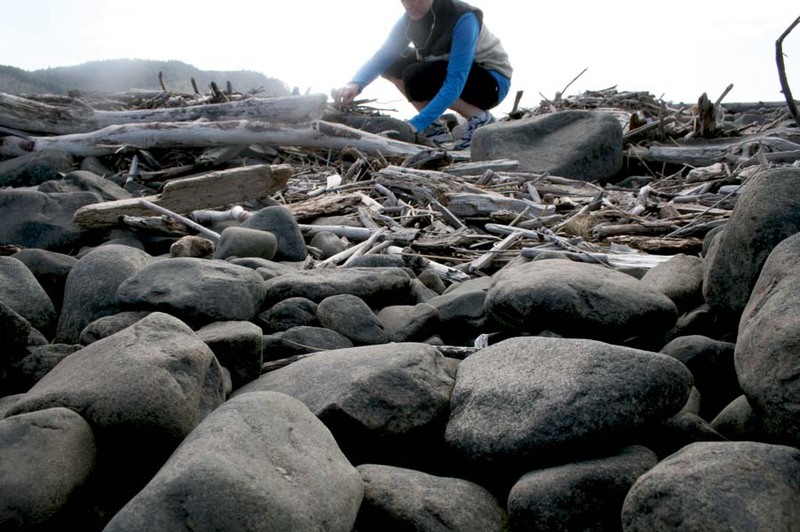 If you have been to the Oregon Coast you will know that there is a CRAZY amount of driftwood- like piles and piles and piles of old wood weathered by the sand and the sea. I spent my childhood crawling around these piles looking for little treasures and to this day it is still one of my favorite ways to spend time! I collected a bag full of interesting shaped driftwood. I began to put pieces together, stack and plan out little houses and buildings. I glued all of the pieces together (with craft glue) to form little buildings that could stand on their own. 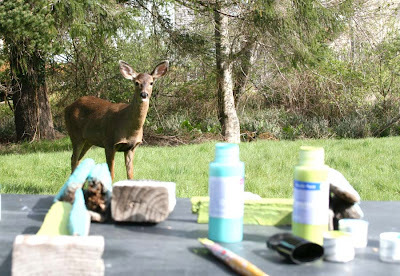 Then I began to paint my city in my makeshift studio- the backyard! I added simple details with permanent pen. 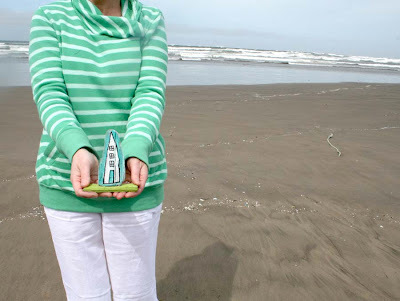 I gathered up my city and my production assistant (my mom) and went to the beach to photograph. The best part of this project (as is with all of my city projects) is taking the pictures in a unique environment! My mom and I had a blast setting up the city in the along the waters edge. NICE! 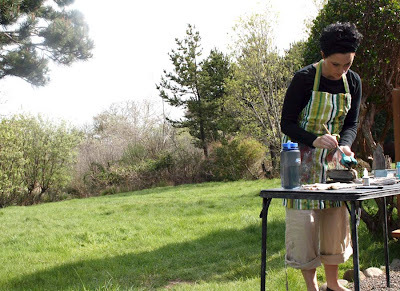 I totally ♥ your outdoor studio. Very cool! I wish we got driftwood like that here! Absolutely wonderful! Such a creative idea. Love it! We have lots of driftwood around our house and deer in our backyard...we are on Lake Erie. I just love this idea and your photos are fantastic, I feel like I am there. Thank you for sharing this. oh wow, what a NEAT tiny city by the ocean. love it! and love the outdoor studio with visitor. 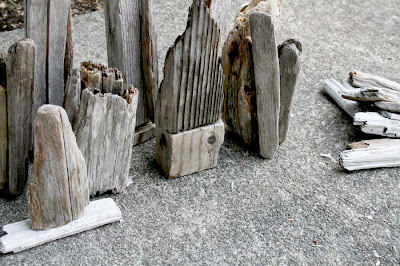 I've been inspired by driftwood since a child, myself....it's here and there in my garden and pots. But now I'm inspired to paint some! 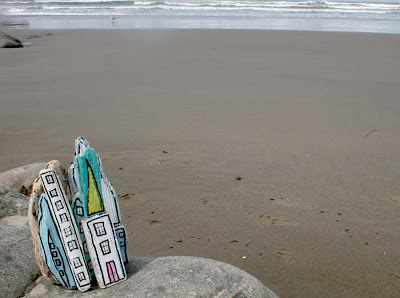 I love your little imaginary cities, sooo cute! 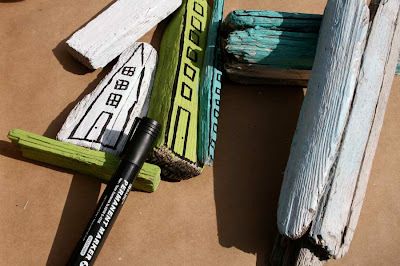 Oh my gosh, I totally need a driftwood city! My hometown also has lots of wood by the water and, now that I'm moving in 3 weeks, I'm gonna have to start beach combing. This should be fun! Thanks for the show and tell! Yep I know all about that driftwood. My beach is Cannon Beach where I gather fun shapes. A really good driftwood beach is Seaside's south end. 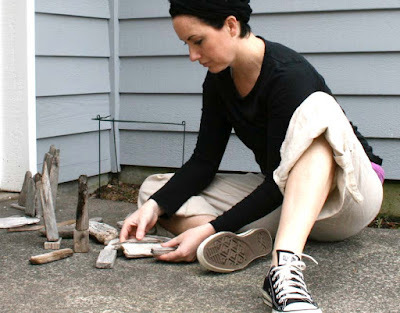 Thanks to you I have another reason to collect driftwood. My grandchildren will LOVE making their own city. Wow . . . where I see just a beautiful piece of driftwood you see art. Luv it! 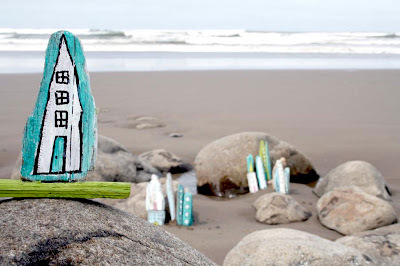 Next time I visit the Oregon coast you can be sure I'll be bringing home some driftwood. Thanks for the inspiration! I too live in Southern CA and I'm always in search of driftwood. :( I absolutely love the color contrast in the last photo. It is just an amazing city. I want to live in it! Love it! I just love your deer friend too! See you at the beach! This is the most adorable thing!!! 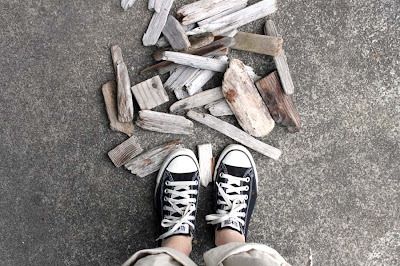 Wish I had used all the driftwood I've collected from the coast of Maine to create that way. Love the colors and structures! Lovely. The drift wood is wonderful. 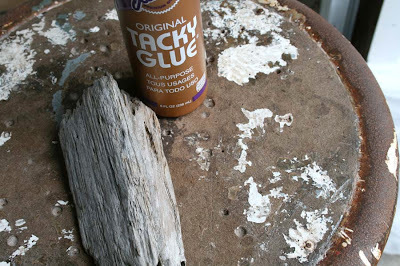 I like the idea of found materials. 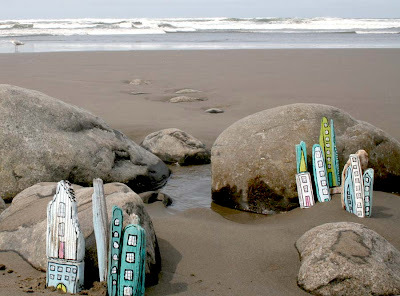 And I also love the setting, the dreamy little cities rising out of the sand and surf. I just love coming to your blog and seeing your posts! You have such an interesting way of looking at things and your photos are amazingly cool. Alisa, you are a true artist! These are even more wonderful than the cardboard ones. Will they get reclaimed by the sea? There is something magical about Oregon....one of my favourite books of all time is Going to Bend by Diane Hammond. The arts community is so alive in Portland from what I have read. Now these pictures from you......wonder how long it takes to drive from Mississauga, Ontario? The drifwood city ROCKS! I swear you could make a silk purse out of a sow's ear! OMG, This is AMAZING! Me and my roomies made a box city, now we will have to try this as well!!!! Simply stunning.Wishing we had more driftwood near our home. ooooh I'm now swooning as I think of a sweet little diftwood city by the ocean. 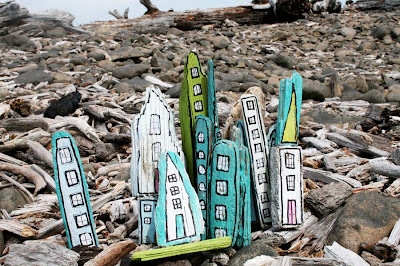 looooove your driftwood city. And oh my, that deer is too cute! What a great idea! 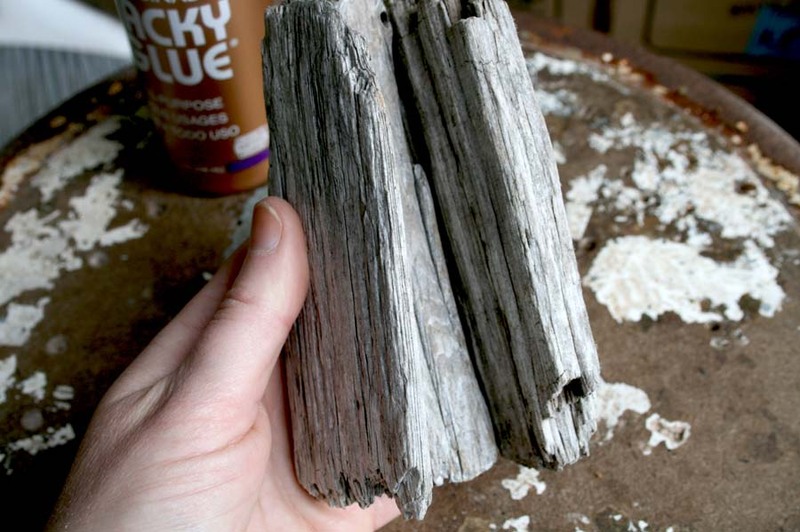 I, too, love driftwood and bring it home from the beach to decorate my deck. I live 3 blocks from the Chesapeake Bay (east coast) and love the beach and all of its gifts. Ok, THIS is my favorite! I know I say that all the time but WOW. I love it! I love your driftwood city! I love collecting stuff on the beach too, more often rocks then driftwood where I go. The pictures are great - it looks like a fun "photo shoot"! So much fun! 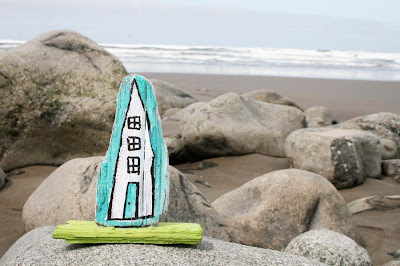 I love the Oregon Coast... definitely need to make the short drive and have fun with some driftwood! How inspiring! We have lots of driftwood along Lake Erie. We always search for beach glass, but we'll look for our city, now! 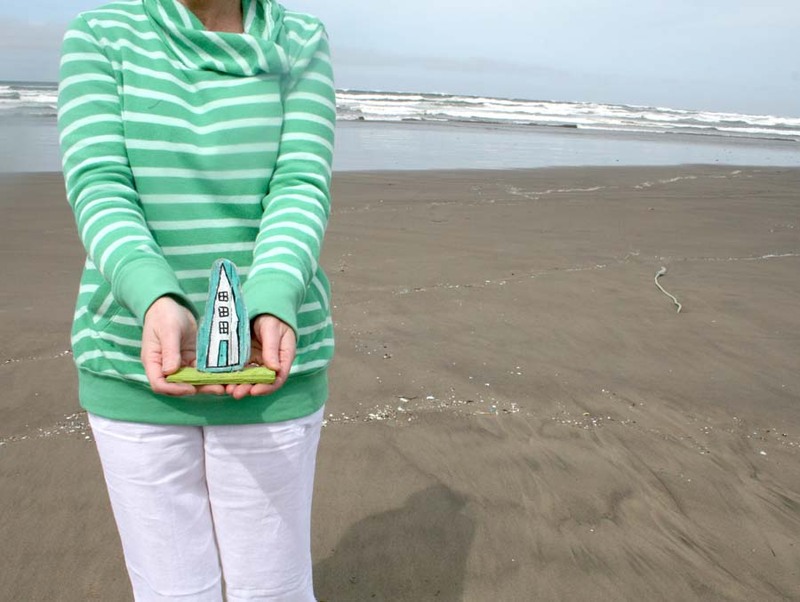 found you thru modernmarks...i'm inspired to do this in fabric...love the oregon coast btw..lucky you to have access to such a wonderful place. Oh my, these are LOVELY!!! Wow!!! I always want to do something with drift wood, but never know quite what! Here in Sydney we have just had some big storms, so on the weekend I took my boys for a walk along the beach to collect driftwood to use with the kids at preschool. Now I know just what to do with them! Your buildings and photos are divine - I love that you took them back to the beach to photograph. as one who grew up by the sea....love love love! we even get deer here smack dab in the middle of DC, but they aren't so brazen. Oh WOW! This is absolutely irresistible ... I am so going to do this ... THANK YOU for sharing! Just back from the beach with a bagful of driftwood, can't wait to get started!! fantastic. i absolutely love this little village! I just love this! We were both linked to on a German(I think) blog, mine were painted stick snakes....I'm so happy to find your site, and introduce myself as well! I have an international blog linking party every Sunday and would love to see you there! Plus I think you'll like lots of the projects on my blog! So pretty ! I like it.